Used equipment may be addressed by several names such as second-hand, pre-owned, refurbished, reconditioned etc. Used medical equipment market in India is said to be 30% of sales in private sector. More and more hospitals are coming up in tier-II & III towns and most of these hospitals serve patients looking for affordable treatment and care. More than 90% of private hospital capacity in India falls in the Small & Medium (SME) segment. Refurbished products are usually priced about 35-65% less than the original equipment and hence provide tremendous value to small-and-medium hospitals that are set-up and operate with budgetary constraints. So, what are the most popular used / refurbished medical equipment in India? Which segment of healthcare providers buy refurbished/used equipment and Why? Who are the key sellers in each of these segments? This article is an attempt to answer some of these questions. What are the most commonly purchased used/ refurbished medical equipment? Hospitals generally prefer to purchase used items in categories with longer life, higher costs or expected lower volume of usage (Why buy new if it is not going to be used much?). For e,g a CT Scanner is a high-value item, could have a good run for 10-20 years depending on the usage. Sometimes hospitals buy used C-arm if case load in say orthopaedics is expected to be low. The biggest segment popular for used segment is ‘Imaging’, followed by ‘critical care’ equipment. ‘Endoscopes’ are the third most sought after category. Many other specific items like Heart & Lung machine, Surgical head lights, autoclave, OT Tables, imaging tables, electrosurgical units, high-end operating microscopes, laparoscopes etc. are also sought after. Some time back, even ICU beds from Hillrom and Huntleigh etc. were in much in demand and imported in India. Key considerations for selection of vendor are ability to offer Support, quality of refurbishing facility and spare parts supply. CT and MRI are certainly the most popular of the refurbished medical equipment. Most mid-sized hospitals and diagnostic centres are looking for affordable options when it comes to high-end imaging equipment. At the same time it is critical to ensure high uptime of the equipment, as every day of down-time can be very expensive for the healthcare provider both in financial terms as well as loss of reputation. The skills required to maintain CT, Cathlab and MRI are scarce and keeping spare parts in stock to meet SLAs can be prohibitively expensive. On one hand, hard-negotiating buyers squeeze every penny of profit required for re-investment into skills and spares, from desperate new sellers – bringing the market prices to untenable lows. These sellers are then unable to maintain the requirements for seamless support. On the other hand some sellers, with an aim to make quick bucks don’t bother to invest in required capabilities for sustained performance. Fly-by-night-operators who, in any business for that matter, ‘join the game’ for quick profit, end-up causing suffering and losses to customers as well as patients. Just a few of such sellers cause damage to reputations of other genuine vendors in the refurbished medical equipment business. Owing to these issues there are only a few trusted players who really invested in people skills, their training, state-of-the art refurbishing facilities and stock of spares, and have succeeded in this market with a name for themselves. The OEMs themselves, GE, Philips, Siemens, Toshiba, Hitachi etc. are big players in the refurbished medical equipment market globally, for CT, MRI and Cathlab. Other players in India like Sanrad, Medirays, Cura have been other long-term players. There are many players, active regionally. CT and Cathlab being radiation equipment, come under strict AERB regulations. Today in India, as per AERB regulations no radiation equipment greater than 10 years of life can be imported. Hence supply of refurbished CT and Cathlab has definitely shrunk. 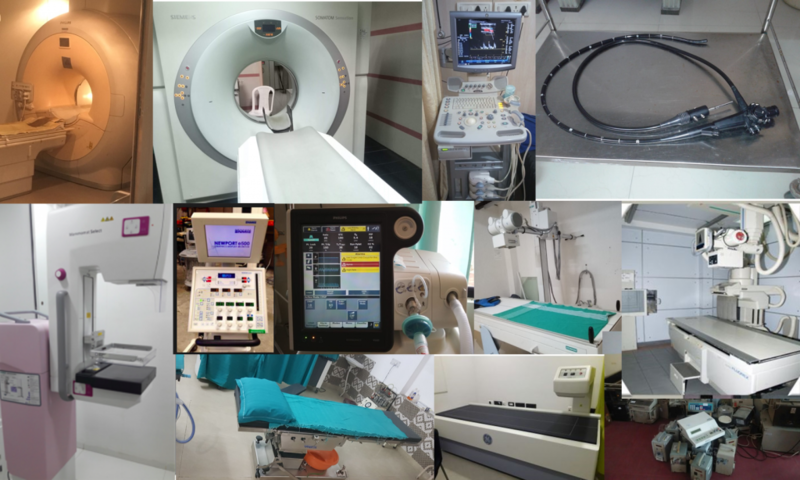 CT- GE Lightspeed and GE Brightspeed series, Siemens Somatom, Siemens Sensation and Siemens Emotion series, Toshiba Aquilion, Philips Brilliance, Hitachi ECLOS etc. Cathlab – Philips Allura FC 9, FD 10, Siemens Axiom Artis, Artis Z, Artis U, Toshiba Infinix 8000, GE Innova series etc. The basic configuration of a SME hospital being set-up today includes, basic OPD, IPD with 20+ beds, 1 / 2 OTs, few ICU beds or step-down ICU and a basic diagnostic facility. An ultrasound machine has come to be part of the basic diagnostic facility along with a small laboratory and X-Ray machine. Most diagnostic centre set-ups too include a little more extensive laboratory and X-Ray, ultrasound facility. Owing to nature of these facilities catering to General medicine, Obgyn and General Surgery cases – the most in demand ultrasound machine is a general purpose colour Doppler with (3/4 probes) – Convex, Linear and TVS probes or if stretched include a cardiac probe. The more popular models are: GE LogiQ P5 , GE LogiQ P3, GE voluson P8, GE Voluson S6/S8, Siemens Accuson X300, GE LogiQ Vivid e portable ultrasound, GE LogiQ Book XP, Sonosite Titan, Sonoscape A6 , Philips HD 6 , Philips HD 7, GE Voluson E8B13, GE LogiQ C5 Premium. Samsumg HS40, Philips HD 11 XE, Philips HD 15, GE LogiQ P9, Mindray DC 7 Ultrasound machine. X-Ray machines are extremely durable equipment, commonly with a life of 15 or more years. They are also being indigenously produced by several Indian players. Service capability is far more common compared to CT/ MRI or Ultrasound machines, especially if it is not High Frequency (HF). Supply has been high for a long time and hence even used spare parts are more easily available. Therefore used X-Ray machine market is highly fragmented with several local players. Hospitals looking to expand into Orthopaedics/ trauma or Urology are looking for basic refurbished C-arm machines. Most Indian manufacturers of X-Ray machines are also offering C-arm machines. The same holds good for used X-Ray machine sellers. Both being radiation equipment come under the purview of AERB regulations. The supplies are mostly from within the country. X-Ray : GE DX 300/500, Siemens Multiophos 10 /15 fixed Ray, Siemens Multimobil 100mA mobile Xray, Allengers 100mA mobile Xray, Genus 60 mobile x-ray, Siemens Polydoros 800mA etc. C arm: Siemens Multimobil 5C, Siemens 5 D, Siemens Multimobil 5E, Allengers HF49 / 49R, Siemens C arm Siremobil Compact L etc. Both Mammography and BMD machines are again radiation equipment, commonly used for screening purposes. Hence buyers of these machines tend to be diagnostic centres or hospitals with high focus on preventive health programs. Also as the breast cancer screening and Osteoporosis screening are generally part of women’s health check package, especially in the higher age group (>35 years), optimum utilization of these equipment generally becomes a challenge. Most buyers therefore prefer lower-end systems that would just about do the job. There are very few suppliers in this segment and most equipment is imported. Some of the popular models are: GE DPX-NT, Lunar or Prodigy series, Siemens Mammomat 1000/3000 Nova | GE DMR PLUS Mammography System, Allengers Mammo Venus Vision Mammography System. Critical care equipment such as Anaesthesia workstation, Ventilators, Defibrillators and even high-end patient monitors have perhaps been some of the most imported and refurbished, used equipment category by volume. There are several importers who acquire equipment in bulk through auctions in other countries and distribute through several local equipment vendors. Market for these refurbished equipment have been established traditionally due to the fact that most mid-sized hospitals could not afford to buy new equipment. However now, there are many affordable options from China and several good quality Indian manufacturers such as Skanray, BPL etc. who have a full range of critical care equipment offerings. Anaesthesia workstations: GE Aestiva5, GE S/5 ADU Carestation, Drager Fabius GS. Drager Narkomed 6400, Datex Ohmeda etc. Patient monitors: Philips MP 20 | Philips MP50 | Philips MP 60| Philips MP 70| GE Datex Ohmeda patient monitor. Upcoming hospitals look for used Endoscopes to start with and upgrade to new when the volumes pick-up. The most popular brands are Olympus (Flexible), Karlstorz, Stryker (Rigid) etc. Most popular models available today are: Olympus Videoscope System – Videoprocessor with built-in Light Source, CV-160 Video System Center, CLV-160 Light Source, Gif140-180 Upper GI Scope, Cif140 Colonoscope Olympus TJF-130 Duodenoscope, Pentax EC-3890FI2, Pentax EG-2990I, Olympus Gastro Videoscope Model-GIF-Q150. Pentax Light Source LH-150 , Pentax Light Source LH-150PC. Why are Autoclaves more in demand than other Sterilizers?Should I ask for the thyroid guard?